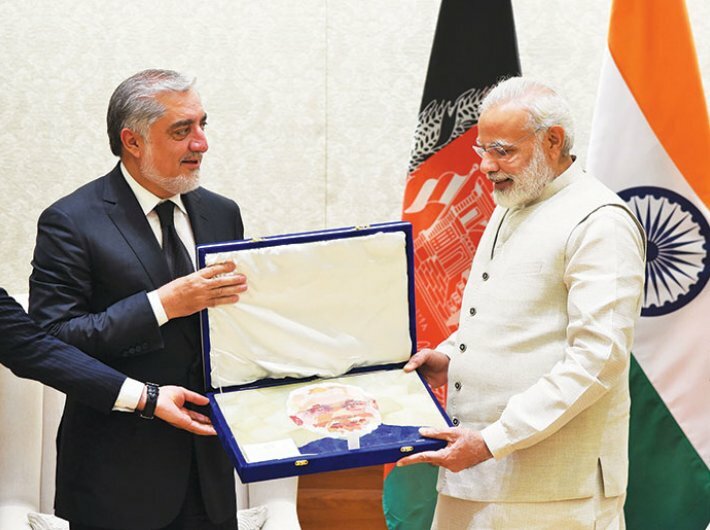 Afghanistan chief executive Abdullah Abdullah calls on prime minister Narendra Modi in New Delhi on September 28. As an emerging global power and the most powerful state in South Asia, India has been perennially concerned about protracted political instability and resultant social turmoil in Afghanistan during the past few decades. Indeed, India’s engagement in the realm of development cooperation, since the overthrow of the Taliban regime in 2001, has increased significantly as it has already invested over $2 billion in Afghanistan. The parliament building in Kabul, the Salma hydroelectric dam in Herat and India’s support in building the Afghan National Agricultural Sciences and Technology University and its multiple campuses are a few obvious manifestations of this cooperation. India started security cooperation with Afghanistan in 2011 and has also delivered Russian-made Mi 25 attack helicopters to the latter. Over the years, three significant factors have cumulatively shaped the Indo-Afghan partnership. First, thanks to its geostrategic location, Afghanistan is a gateway to three major Asian regions – South Asia, West Asia and Central Asia. Especially, its sheer location can provide access to markets of resource rich states of Central Asia. The territorial space of Afghanistan has always facilitated trade of commodities including drugs and arms. Sadly, the economy of Afghanistan is virtually shaped by poppies or ‘red gold’. Its opium industry employs over 3 million people. Earlier, the warlords in intra-state/factional conflicts had also used drugs to pay for weapons. Second, Afghanistan itself is endowed with various mineral resources, including gold, copper, uranium, oil, iron ore, cobalt and natural gas. Third, India desperately requires political stability in Afghanistan, owing to its growing involvement. In fact, the multi-ethnic state in Afghanistan has been witnessing a bitter fight between the democratically elected de jure political regimes and Taliban forces that represent radical Islam. At this juncture, according to the Taliban’s own version, which is supposed to be almost accurate, the Taliban controls 34 districts fully and in another 167 districts they are contesting the government by controlling areas of 40 to 99 percent. Terrorist activities of the Taliban have been boosted by Pakistan. Irrespective of its ostensible commitment to war against terror, Pakistan has always aided the Taliban through agencies like the Inter-Services Intelligence (ISI) in the pursuit of serving its ambitions in India and Afghanistan. The Haqqani network, responsible for hundreds of attacks on the US and Afghan forces, has been well integrated within the structures of the Taliban. Unlike the preceding US administrations that surely showed awareness of Pakistan’s duplicitous/dubious role in the war against terror, the Trump administration has emphatically chosen to identify Pakistan as a part of the Afghan problem and not the solution to the problem. In fact, during Modi-Trump Washington meet of June 2017, not only did Trump express concern over political instability in Afghanistan but India and the USA also showed determination to combat terrorism in South and South-West Asia. The USA declared Syed Salahuddin, the leader of the Hizbul Mujahideen, a global terrorist while appreciating India’s positive role in Afghanistan. In the process of advancing its footprint in Afghanistan, India is constrained to negotiate with strife-torn Afghanistan as well as shifting stances of alliances and counter-alliances among major actors that are at work in Afghanistan. Unsurprisingly, most global as well as regional powers, including the USA, China, Iran, Russia, India, and Pakistan, are involved in influencing developments in Afghanistan. India’s forthcoming moves in Afghanistan could be visualised by assessing the roles played by all these powers. After the war on terrorism went into full swing, the USA-led North Atlantic Treaty Organisation (NATO) forces worked consistently to contain the Taliban advances and to stabilise democratic institutions in Afghanistan. The Afghan National Security Force (ANSF) received training as well as combat equipment to counter the Taliban forces. With the roughly 1,30,000 NATO forces on ground, the Karzai regime (2001-14) felt more secure to promote developmental activities. However, the Obama administration had set a timeline for the withdrawal of the USA’s forces after 2014 so that Afghanistan can manage their own affairs. After 2014, the number of USA forces was drastically reduced to roughly 9,000, which not merely added to the insecurity of the political regime in Afghanistan, but also of its friends such as India. Besides, the Taliban felt encouraged to launch a fresh offensive on the government. The steady withdrawal of a military superpower such as the USA has and will create a power vacuum in Afghanistan and West Asia. The USA is frustrated in its Afghan venture. In spite of spending billions of dollars, the Af-Pak region still requires its troops to beef up security. Even after accepting the USA’s monetary support to counter terrorism, as Trump has asserted, Pakistan has not ceased to support terrorist activities covertly through the ISI. Hence, the USA will be still constrained to carve out its own strategy and space by sending additional troops. China has been clearly averse to the USA’s presence in Afghanistan. Since 2010, China has been increasing its investments in Afghanistan. For instance, the Metallurgical Corporation of China (MCC) pledged $3.5 billion to develop copper mines in Aynak. The Chinese involvement in the spheres of security and development in Afghanistan could be untangled thus. The Chinese are aware of the connection between major terrorist organisations such as Al Qaeda and the Taliban and the latter’s capacity to fuel insurgencies. In fact, a section of Uighurs of Xinjiang is linked to radical Islamic elements in Pakistan, Afghanistan and Taliban. China has preferred to negotiate with the Taliban. Moreover, China has also embarked on ambitious projects such as One Belt One Road (OBOR) and China Pakistan Economic Corridor (CPEC). It has opted to invest $50 billion to build CPEC. For China, Pakistan is a bridge to establish link with Afghanistan via the Karakoram Highway, apart from the hazardous Central Asian route. Like China, Iran too has opposed the USA’s presence in Afghanistan. Apart from trading and supporting reconstruction efforts, Iran is operating in Afghanistan through Shia communities among the Hazaras and Quizibash ethnic groups. The Islamic revolution in Iran of 1979 and the overall Islamic orientation of Iran has appealed to radical Islamic groups although Iran had supported Northern Alliance in its fight against the Taliban. Ironically, several years after its withdrawal from Afghanistan, Russia is steadily becoming a part of the geopolitical quagmire in Afghanistan. Basically Russia has been fighting the Islamic State (IS) in Syria and it wants to ensure that Afghanistan does not become a safe haven for the IS. Not surprisingly, it is the threat of the IS that has brought the Taliban and Russia closer. Russians can also use the Taliban to put pressure on Washington. Meanwhile, the Taliban has opened its office at Doha in 2013 to talk to external powers. Russia, China and Pakistan, in their trilateral diplomatic meeting in December 2016, had supported a plea to remove the UN ban on Taliban leaders. Subsequently, in March 2017 the Chinese hosted a Taliban delegation, sent from the Doha office, led by chief Sher Abbas Stanikazi. By now, Russia, China, Pakistan and even the USA are keen to bring the Taliban on the negotiating table. Furthermore, Norway has started mediating between the contending parties in Afghanistan. The Taliban Afghans have met the Norwegians in Oslo, Karachi and Bangkok. The idea of initiating dialogue with the Taliban or discerning between the ‘good’ and ‘bad’ Taliban is contrary to India’s consistent stance on terror. India has been uncompromising in its condemnation of terrorist forms of violence, internally (Maoists/jihadists) as well as externally. And yet, India can hardly overlook the fact that over 60,000 armed men are with the Taliban that has captured almost 40 percent of the land in Afghanistan. Moreover, other major powers do welcome multilateral process of dialogue with the Taliban. In the light of its existing investments and long-term interests, India too cannot entirely rule out the process of dialogue between the Ghani regime and the Taliban. In May 2017 the Ghani regime had successfully brought Gulbuddin Hekmatyar, leader of Hizb–i-Islami, to the negotiating table. Infamously characterised as butcher of Kabul in the 1990s, Hekmatyar was a warlord for some but certainly a designated terrorist for the USA-led coalition. Hekmatyar appreciated India’s development efforts in Afghanistan. India’s envoy to Kabul Manpreet Vohra and Hekmatyar sat down to discuss peace and stability in Afghanistan in May 2017. In effect, India shared flag with Hizb-i-Islami on stage. Since Pakistan continues to deny India access to Afghanistan through its territory, India is working on circumventing the Pakistan route by making the Chabahar port operative in Iran to reach Afghanistan. In substance, several questions beg answers if at all India begin dialogue with Afghan Taliban. For instance, what could be the terms of reference? While participating in the power-sharing process, will the Taliban be ready to eschew violence in any form? Will the Taliban follow the constitution of the Islamic Republic of Afghanistan or would they still visualise themselves as the Islamic Emirate of Afghanistan and opt to follow the Sharia law? Haven’t the Taliban’s links with ISI and destructive role that the latter has played in Kashmir affected India adversely? Keeping undeniable influence of Pakistan over the Taliban and Quetta Shura, India will have to design its policy quite cautiously within a long term frame without losing sight of the current situation of flux and changing domestic realities of Afghan politics. Harshé is founder and former vice chancellor of the Central University of Allahabad and president, GB Pant Social Science Institute, Allahabad.